The air is cold, the wind still, the sky gray. 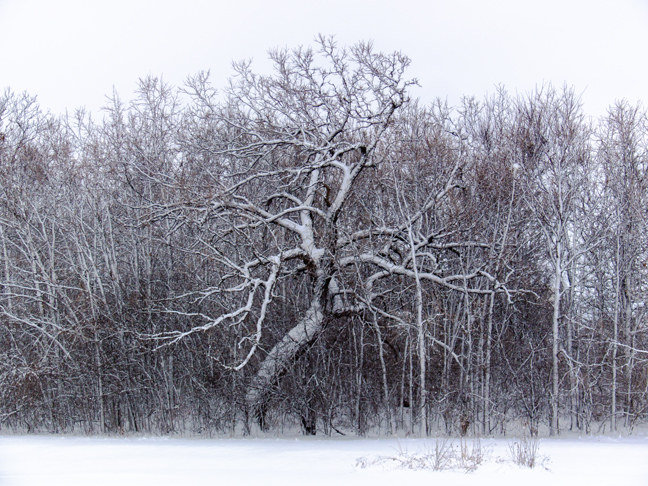 One last blanket of snow has dusted the sleeping timber, thick, dense, entwined. The old tree at their midst has seen this all before, this time of rousing from deeply chilled but peaceful slumber. It knows that soon curious young squirrels will stir and birds arrive, weary from journeying north. There is not much color yet, but some, tender buds of leaves to come are very gently emerging from crusted bark along still brittle branches, life's softening sap having just begun its skyward flow within. It is a time of promise, and yet of lament for the serenity of protective repose. In days to come, the sun will shine and warm the scene. Fresh life will stir and conflict will arise, each species jostling for position. Some will thrive and some will die. Some too will find cooperative entanglement the most viable path toward sustainment. The old tree is of that ilk. From moss to birds to squirrels to insects meandering its gnarled surfaces to bacteria beneath the grounds tickling its roots, it knows and feels the enveloping web of seething entwinement that helps sustain its enduring existence. It does not fear the awakening, but breaths and drinks it in for all its warm communal comfort. May the coming awakening of Spring afford you fresh paths toward sustaining fulfilling entanglement.